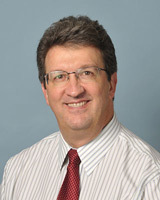 Dennis Mishler, MD, is an assistant professor of clinical medicine at the Indiana University School of Medicine and a transplant nephrologist at Indiana University Health. He received his medical degree from Indiana University School of Medicine. He also completed his residency and nephrology fellowship at the IU School of Medicine. Dr. Mishler's clinical interests include caring for patients on hemodialysis, helping patients successfully receive kidney transplants, and helping patients successfully keep their transplant and never going back for the need of dialysis.